Another perfect day for Canada at the 2018 World Under-17 Hockey Challenge featured big performances from Connor McClennon (Kootenay ICE), Seth Jarvis (Portland Winterhawks) and Ryan O’Rourke (Sault Ste. Marie Greyhounds) in wins for their respective clubs. Here’s a closer look at the action to wrap up the preliminary round. Seth Jarvis (Portland Winterhawks) scored the overtime winner with 10 seconds to spare to help Team Canada Red improve to 2-1 with a 4-3 victory over Finland. 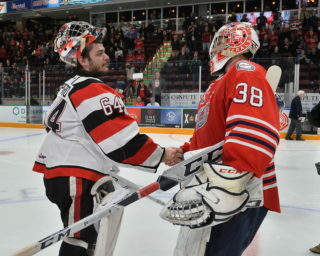 Goaltender Dylan Garand (Kamloops Blazers) was sensational with 43 saves while both William Villeneuve (Saint John Sea Dogs) and Cole Shepard picked up two assists. 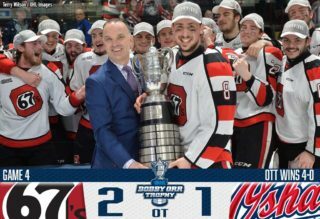 Justin Sourdif (Vancouver Giants), Nolan Seed (Owen Sound Attack) and Stephen Halliday added markers for Canada before a two-goal lead slipped away, resulting in overtime. Roni Hirvonen, Ruben Rafkin and Joel Maatta were Finnish goal-scorers as they fell to 1-2 on the tournament. Canada Red will face the United States in quarter-final play on Thursday while Finland faces Canada White. Ryan O’Rourke (Sault Ste. Marie Greyhounds) came through in the clutch again as Team Canada Black edged the United States 5-4. O’Rourke scored the game winner with 1:31 left in the third period as Canada Black wrapped up the preliminary round with a 2-1 record. 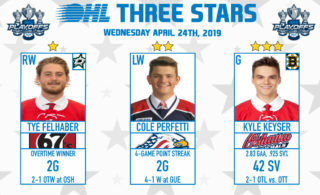 O’Rourke joined Kyle Crnkovic (Saskatoon Blades) and Quinton Byfield (Sudbury Wolves) with a goal and an assist in the win while Ozzy Wiesblatt (Prince Albert Raiders) and Will Cuylle (Windsor Spitfires) also scored. Canada Black was outshot 31-24 as goaltender Joe Vrbetic (North Bay Battalion) turned aside 27 shots. The consecutive losses are the United States’ first in the preliminary round since 1997. Connor McClennon (Kootenay ICE) continued his torrid pace, adding two more goals as Team Canada White stayed perfect with a 5-1 victory over the Czech Republic. Jérémie Poirier chipped in with a goal and an assist while Théo Rochette had two helpers as Canada White improved to 3-0. 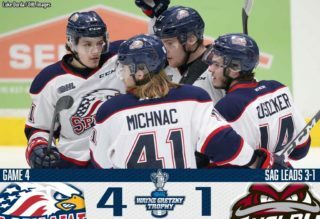 Dylan Robinson (Oshawa Generals) and Charlie DesRoches (Saint John Sea Dogs) added singles while goaltender Tristan Lennox (Saginaw Spirit) stopped 24 of the 25 shots he faced. Jan Cikhart provided the Czech Republic’s lone marker as they fell to 0-3 in the tournament. Canada White will square off against Finland in quarter-final play on Thursday while the Czechs will take on Russia. Yaroslav Askarov pitched a 22-save shutout while Ivan Didkovski, Pavel Tyutnev and Daniil Gushchin found the back of the net as Russia blanked Sweden 3-0. Russia closes out preliminary play at 2-1 while Sweden sits at 1-2.